To Cite: Ghasemi S, Mafi Gholami R, Yazdanian M. Biosorption of Heavy Metal From Cadmium Rich Aqueous Solutions by Tea Waste as a Low Cost Bio-Adsorbent, Jundishapur J Health Sci. 2017 ; 9(1):e37301. doi: 10.17795/jjhs-37301. Background: Heavy metals pollution is a serious threat to environment and human health. Therefore, it is vital to find an effective method to remove heavy metals from natural resources. Objectives: The current study aimed to investigate the adsorption capacity of cadmium from synthetic solution by tea waste as a biomass. Methods: The experiments were conducted in batch system and the effect of pH, adsorbent quantity, contact time and the initial concentration of cadmium were examined. The most common isotherms and kinetics of adsorption were applied to analyze cadmium adsorption and the reaction rate. 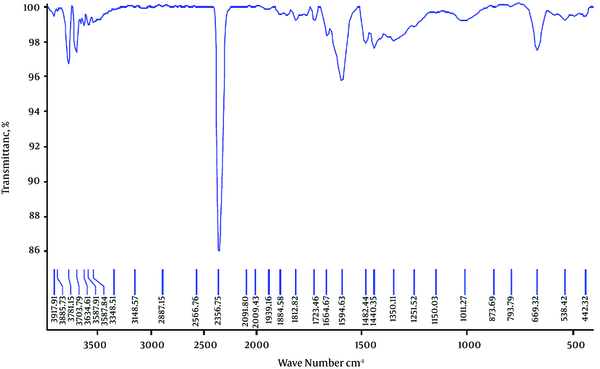 Moreover, morphological characteristics before and after the adsorption process and also molecular structures of tea waste were determined by scanning electron microscope (SEM) and Fourier transform infrared spectrometry (FTIR); also, the surface area size of tea waste was measured using Brunauer-Emmett-Teller (BET). Results: According to the results, the maximum efficiency of cadmium adsorption was 99.50% obtained in pH of 5 and contact time of 90 minutes and 10 g/L of adsorbent. With the increase of initial concentration of cadmium, the amount of the adsorbed metal increased, but the removal percentage decreased. Data for this study indicated a good correspondence with both isotherms of Longmire and Freundlich. The analysis of kinetic indicated that cadmium adsorption was consistent with the second-degree kinetic adsorption model. Conclusions: According to the high efficiency of cadmium elimination by tea waste, this approach is applicable as an efficient and affordable trend to remove cadmium from aqueous solution without any chemical or physical pre-treatment. Copyright © 2016, Ahvaz Jundishapur University of Medical Sciences. This is an open-access article distributed under the terms of the Creative Commons Attribution-NonCommercial 4.0 International License (http://creativecommons.org/licenses/by-nc/4.0/) which permits copy and redistribute the material just in noncommercial usages, provided the original work is properly cited. Nowadays, water resources pollution is a great concern caused by heavy metals, radioactive compounds, organic and inorganic substantial. Heavy metals are especially important due to their non-biodegradable nature and harmful physiological effects on animals (1). One of the main causes of the accumulation of heavy metals in the environment is rapid industrialization and population growth (2). As a result, the effective removal of metals from aqueous environments is considered as an important issue in industrial countries (3, 4). Biochemical toxic effect of heavy metals is due to the strong tendency of metal cations to react with the sulfur. The cations of heavy metals or molecules involve them and enter the body through ingestion, then easily connect to sulfhydryl groups (-SH) abundant in the human body. Metal-sulfur bond usually affects enzymes that control the rate of metabolic reactions in the human body; therefore, these enzymes cannot do their normal duties and consequently human health falls in danger and sometimes may lead to death (5). Also, cadmium causes damage to liver and lung, blood pressure, kidney failure, birth defects, cancer and mutagen (6). According to potable water standard codified by world health organization (WHO) and the American water works association; the permissible quantity of cadmium in drinking water is 0.005 mg/L (7). There are many methods to remove heavy metal ions from wastewater which can be considered as chemical separation, filtration, membrane separation, electrochemical treatment, adsorption and ion exchange (8). In recent years, adsorption is considered by many environmental friendly researchers due to its simple, low-cost and effective trend to remove heavy metal ions (9-11). Heavy metals removal by natural and cheap adsorbents was investigated from the 1970s. Larsen and Schierup studied this issue by activated carbon extracted from burning straw to remove cadmium (12). Tarley et al. studied rice husk to remove metals such as lead while to gain higher efficacy some adjustments were fulfilled (13). Ghasemi and Mafigholami succeeded to remove lead from aqueous solutions with high removal efficiency using sawdust of Prosopis (Mimosaceae) (14). Cay introduced tea waste as a cheap biosorption to attract copper (1). In another research, Hosseini et al. showed that tea waste with magnetite nanoparticles can be an attractive option for heavy metal removal from contaminated water (15). Other natural and low cost absorbents such as pine, oak, walnut and natural coagulants can be noted (16-21). Experimental trials on using natural and inexpensive absorbents are widely applied in various countries to refine industrial wastewater. Adsorption mechanism of heavy metals by tea waste seems to be conducted by compound and groups such as the caffeine, theophylline, tannin, catechin, fluoride, etc. with metals constitute bond and their absorption. Statistically, Iran is the 4th largest consumer of tea in the world; therefore it is proposed to deal with feasibility of removing cadmium from aqueous solutions using tea waste which is available in large extent and known as waste. In the current study, the effectiveness of this biomass in the absorption process is discussed. After collection of tea waste adsorbent, it was homogenized by mesh 35 and then it was washed with distilled water to remove dust and other pollutants, then dried in oven at 30°C. Cadmium nitrate was used to make synthetic solution. For this purpose, first the cadmium solution with concentration of 25 mg/L was prepared. Then the other concentrations were prepared by diluting the main solution. All the chemicals were purchased from Merck company (Germany). The experimental stages were conducted at 30°C and the remained concentration of the metal was determined by atomic absorption spectrophotometer (PG model, England) (22). It is important to consider that all the experiments were replicated three times and the mean of data and the results were determined and used. To determine optimum pH, the pH meter (Inolab pH 720 model, Germany), ranging from 3 to 10, was used. After pH adjustment using hydrochloric acid and 0.1 N NaOH solution, considering other fixed parameters, 0.5 g of tea waste was added to 50 mL of the sample with 10 mg/L cadmium concentration. After 30 minutes, the concentration of remained cadmium was measured. In this step, to determine the optimum quantity of adsorbent with consideration of other fixed parameters, 0.15, 0.3 and 0.5 g of tea waste were added to the 50 mL solutions with the initial cadmium concentration of 10 mg/L and with the optimum obtained pH quantity from the previous stage. After 30 minutes of contact time, the concentration of the remained cadmium in the solution was measured. To examine contact time effect with consideration of other fixed parameters, after the preparation of 50 mL solutions with the initial cadmium concentration of 10 mg/L, the optimum quantities of tea waste and pH were exerted to the samples; then they were taken out from the mixer at intervals between 15 to 90 minutes and analyzed. In order to examine the effect of initial concentration of cadmium on the adsorption efficiency, considering initial concentration as variable and the other fixed parameters, 50 mL solutions were prepared with the initial concentrations of 5, 10, 15, 20 and 25 mg/L and analyzed after adjustment and adding the optimum quantity of pH and tea waste in the optimum contact time obtained in the previous stage. At this stage, scanning electron microscope (SEM) (XL30 model, the Netherlands), Fourier transform infrared spectrometry (FTIR) (PerkinElmer BX-II model, USA) and Brunauer-Emmett-Teller (BET) (Belsorp mini II model, Japan) devices were applied to identify the morphology, molecular structure and surface area of tea waste and cadmium adsorption. Figure 1 shows the results of various pH effects on the adsorption percentage. Based on the achieved results, with the increase of pH up to 5, the removal efficiency increased and decreased after that. According to the conducted studies, in acidic pH, the concentration of H+ ion is high in the solution and this cation competes with cadmium to set on the adsorption places and cadmium adsorption decreases and in higher pH, concentration of OH- ion is high and cadmium deposits are observed and adsorption rate decreases. It was consistent with the results of the study by Saki et al., in Iran (6). 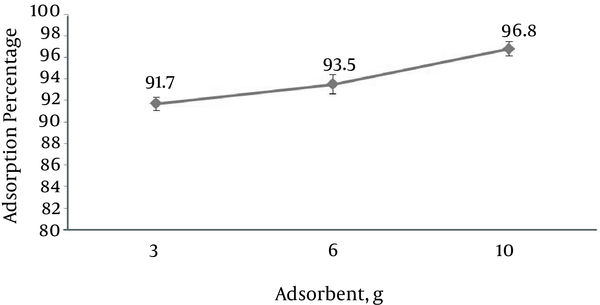 The results of the effect of adsorbent quantity on the cadmium adsorption are presented in Figure 2. The results showed that the removal rate of cadmium by tea waste increased with the increase of adsorbent quantity, since the increase of adsorbent quantity increased the quantity of contact surface of adsorbent with cadmium, the efficiency of adsorption increased. These results were consistent with those of the study by Kumar et al. titled: “Removal of copper from aqueous solution using Ulva fasciata sp., a marine green algae”, in India (23); also consistent with the results of the study by Ozer et al. (24). The results of different contact time on the adsorption rate of cadmium are shown in Figure 3. Based on the results, removal efficiency increased parallel with the increase of contact time and after 90 minutes, it reached maximum removal level and this time was considered as the equilibrium response time. The reason for this behavior was that with the increase contact time, encounter between adsorbent and metals increased. It was consistent with the results of the study by Chonjnaka et al. titled: “Biosorption of Cr 3+, Cd 2+ and Cu 2+ ions by blue-green algae Spirulina sp. ; kinetics, equilibrium and the mechanism of the process”, in Poland (25). Where C0 is the initial concentration of adsorbed substance (mg/L), Ce is the concentration of the adsorbed substance after adsorption (mg/L), V is the volume of the solution (L) and W is the weight of adsorbent substance (g). The results of examination of the initial concentration effect of cadmium on adsorption are shown in Figure 4. The data showed that with the increase of initial concentration of cadmium, the quantity of adsorbed substance (adsorption capacity) increased, but the adsorption percentage decreased, in a way that with the increase of initial concentration of cadmium from 5 to 25 mg/L, adsorption capacity increased from 0.497 to 2.397 mg/g and removal percentage decreased from 99.5% to 95.88%. This issue can be concluded due to more free bands of adsorbent and ion exchange in low concentrations of cadmium. Furthermore, in batch adsorption systems, the input concentration of cadmium in the solution plays a crucial role as the motivating force to overcome the resistance of the mass transfer between liquid and solid phases. Therefore, with the increase of cadmium concentration in the solution, the adsorption capacity of cadmium increased. These results were consistent with those of the study by Saki et al. conducted in Iran (6). Analytical information was obtained from isotherms to develop necessary equation for designing. Furthermore, adsorption isotherm can be used to describe the reaction of adsorbing substance with adsorbent and optimize the quantity of adsorbent application (26). RL indicates the type of isotherm. 0 < RL< 1 for optimum adsorption, RL > 1 for non-optimum adsorption, RL = 1 for linear adsorption and RL = 0 for irreversible adsorption (30). The results of Langmuir isotherm analyses are shown in Table 1, according to the obtained results of RL = 0.0025 and correlation coefficient of R2 = 0.9317, achieved data were conformed to Langmuir isotherm. Where KF is adsorption capacity (mg/g), 1/n is the intensity of adsorption, Ce is the equilibrium concentration (mg/L) and qe is the adsorbed substance (mg/g). From the linear diagram log (qe) against log(Ce), KF and 1/n are determined that 1/n indicates the type of adsorption process, if 1/n = 0 it shows irreversible process, 0 < 1/n < 1 shows optimum adsorption state and if 1/n >1 indicates non-optimum adsorption (34). The results of Freundlich isotherm analyses are shown in Table 2, according to the obtained results of 1/n = 0.409 and correlation coefficient of R2 = 0.9791, achieved data were conformed to Freundlich isotherm. Of course it is necessary to consider that conforming the adsorption process by Langmuir isotherm does not mean that compliance of all the Langmuir hypotheses and formulating Langmuir are rarely compatible in a wide range of the concentrations, while the Freundlich isotherm is more sufficient and completely compliance to data. These results were consistent with those of the study by Hosseeini et al. titled: “Removal of Cu (II) from aqueous solution by modified tea waste with magnetic nanoparticles”, in Iran (15). One of the most important factors of adsorption process is prediction of adsorption rate. The adsorption kinetic depends on the physical and chemical properties of adsorbent that affects adsorption mechanism. In this equation, qe is the adsorption capacity of tea waste in equilibrium condition (mg/g), qt is the quantity of adsorbed cadmium in time (mg/g) and K1 is a constant of first-degree equilibrium velocity (1/min). The first-degree kinetic model is obtained by linear drawing of log (qe-qt) on the basis of t, which K1 and qe are drawn from slope and intercept, and R2 correlation coefficient can be also obtained from the diagram. The results of the first-degree adsorption kinetic are shown in Table 3. According to the parameters and diagram, it can be concluded that the data do not follow the first-degree adsorption kinetic model, since in spite of optimum R2, quantities of qe from the experiment are not equal to those of the diagram. In which, qe is the adsorption capacity of tea waste in the equilibrium condition (mg/g), qt is the adsorbed cadmium quantity in time (mg/g) and K2 is a constant of second-degree equilibrium velocity (g/mg/min). The second-degree kinetic model is obtained by linear drawing of t/qt on the basis of t that qe and K2 are drawn from slope and intercept and correlation coefficient R2 can be also obtained from the diagram. The results of the second-degree adsorption kinetic are shown in Table 4. According to the parameters and diagram, it can be concluded that the data follow the second-degree adsorption kinetic model since the quantity of R2 is optimum and obtained qe quantities from the experiment are equal to those of the diagram. The study by Chen et al. to determine the kinetic behavior of adsorption heavy metals in China clarified that the adsorption of heavy metals in aqueous solutions was consistent with the second-degree kinetic adsorption model (40). Figures 5 and 6 show images from the surface structure of tea waste by scanning electron microscope (SEM). Figure 5 shows the images before the adsorption of tea waste in different magnifications that show porous structure. Figure 6 shows the images after the adsorption of tea waste in different magnifications that metals have filled pores and the adsorption process is also conducted according to the results of the BET analysis, surface area of tea waste was 0.79 m2/g. In Figure 7, given the obtained frequencies which are 1500 - 4000 cm-1, it is indicated that there are O-H, C-H, C = C and C = N bonds and cell walls generally contain caffeine, theophylline, tannin, catechin, fluoride, etc. 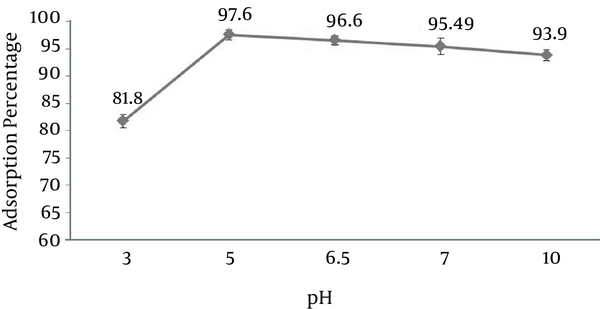 The results of the study indicated that the highest adsorption efficiency was 99.50% achieved in optimum conditions of pH = 5, adsorbent quantity of 10 g/L, 90 minutes of contact time and the initial cadmium concentration of 5 mg/L. With the increase of initial concentration of cadmium, the amount of the adsorbed metal increased, but the removal percentage decreased. The study data indicated a good correspondence with both isotherms of Longmire and Freundlich. The analysis of kinetic indicated that cadmium adsorption was consistent with that of the second-degree kinetic adsorption model. According to the considerable removal percentage of tea waste in cadmium removal, this method can be considered as an effective method to remove heavy metals. Complex structure in cell wall of the absorbents led to a variety of mechanisms in regard to charge trapping metal ions subpoenaed. Ion exchange and formation of hydrogen bonds are among the principles of mechanisms for biosorption of metal ions (41). The authors wish to thank young researchers and elite club at Islamic Azad University of Ahvaz for its financial supports and laboratory facilitates.